Claire: Welcome, David. Please can you tell us a little about yourself? David: Hi, Claire and thanks for asking me to do this interview. My name is David P. Forsyth and I am an indie author of science fiction. I live in Malibu, California, and have written four novel length books and three novellas so far. I hold a master’s degree in international relations have worked in a variety of industries, from general aviation and travel marketing to construction management, before trying my hand at writing. I hope I have found my true calling as an author. Claire: When and why did you start writing? David: I started writing fiction in 2011 after reading a Kindle ebook and realizing that it was possible to reach an audience without going through the gatekeepers of agents and publishers. My mother had been a published author and I had always wanted to follow in her footsteps, but had seen the angst she went through to get there. The indie ebook revolution has opened up a whole new market where aspiring authors can release independently and let the readers decide for themselves which books are worthy. My first novel was entitled Voyage of the Dead. It’s an apocalyptic adventure that follows survivors aboard a ship sailing through a zombie apocalypse. It was released in January, 2012, and I followed up with two sequels, Flotilla of the Dead and Deluge of the Dead. Together they form the Sovereign Spirit Saga: Volume One which is a 300,000 word (788 page) trilogy that is currently on the Kindle Best Seller charts for Sea Adventures and Post-Apocalyptic Fiction. Claire: We know that you are excited to have just released a new book called Sedulity, could you tell us a little about it? David: Absolutely! Sedulity #1 Impact is a different type of apocalyptic thriller. This series is also set aboard a ship, but that is where the similarities end. Instead zombies, the threat in this book is posed by forces of nature unleashed by an asteroid strike. 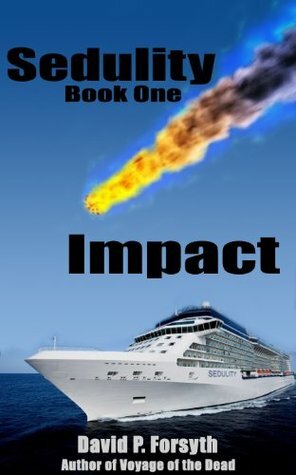 The story follows the passengers and crew a cruise ship, named the Sedulity, en route to Australia when asteroid strikes the middle of the Pacific Ocean. It’s a fast paced adventure combining the threat of apocalyptic catastrophes with the heroic efforts of survivors to improvise and overcome against long odds. Sedulity has been very well received, climbing quickly up the Amazon Kindle Best Sellers’ ranks to #1 in Sea Adventures and #5 in Post-Apocalyptic Fiction, with an overall sales rank close to #500 among the millions of titles for sale on Kinde. Needless to say, I am indeed excited, especially by the excellent reviews it is receiving. However, while Sedulity is selling extremely well in USA, it has not yet taken off on Amazon.co.uk. I’m hoping that this interview will introduce Sedulity to more readers in the UK. Claire: Do you have any other projects going on? David: Yes, I am working on a fourth book in the Sovereign Spirit Saga, but my priority is to complete Sedulity #2 Aftershock for release this Summer or Fall. I think it is important to follow up with the sequel as soon as possible, while the first book is still fresh in readers’ minds. Claire: What books do you like reading? David: My own reading tastes are reflected in my writing. One of my all-time favourite books is Lucifer’s Hammer (1977 by Jerry Pournelle and Larry Niven). In fact, it is the stated inspiration for Sedulity although the plots are quite different. I’m a fan of apocalyptic fiction, which is one reason I founded ApcaCon in 2012 to promote indie authors in the genre. I also love classic science fiction and fantasy, as well as zombie horror, and I enjoy techno thrillers and some historical fiction. Claire: Do you have any favourite authors? David: Many of them! My indie idol is Hugh Howey, not only because his books are excellent, but also a trailblazer for securing the rights and interests of indie authors. There are also a whole group of indie authors in the apocalyptic genre that it has been a great pleasure to get to know too many to list. It’s a tight-knit group of talented writers and I am very grateful to have been accepted into the fold. In terms of lifelong influences, Asimov, Tolkien, Heinlein, Pournelle, Bradbury, Frank Herbert and H.G. Wells stand out in my mind. Claire: Do you have any advice that could help wannabe writers? David: I think the best training for any aspiring writer is to read and read and read until you feel the need to write. Then write something you would want to read. Also, while you can bypass the gatekeepers (publishers) and reach readers as an indie author, you should still get a professional editor (or at least a competent group of Beta readers). There are plenty of good stories being told that bomb due to lack of editing and proofreading. Claire: What do you like doing when you are not reading or writing? David: I’m a licensed pilot and certified scuba diver, as well as an avid reader. I enjoy skiing and fishing and going to the beach, and I love to travel. I actually did extensive travel as part of my research for Sedulity, including a two week cruise to Europe during which I spoke to the Captain, Chief Engineer and other members of the crew about the ship, her systems and the functions of her officers and crew. It was quite valuable to be able to picture the layout of that ship and recall my experience abaord her when it came time to describe the fictional Sedulity in the book. Claire: When did you start feeling like an author? David: I’d have to say that feeling came in mid-2012 after my first two books were doing well and I was working on my third in the series. However, the feeling didn’t come from me. It came from my Mother who started referring to me as, “My son, the author.” She was really proud of me. That meant so much to me and I am glad I had the chance to dedicate one of my books to her. She passed away in January, 2013, which squashed my creative output for much of last year, but I am deeply grateful that she got to see the early success of my first books. Claire: Do you have a blog/website/Facebook page that you can share with us? David: Absolutely! Let’s start with the links to my books, because I am sure people will be more interested in reading my work than visiting me online. Sedulity is available at Amazon US and UK. Sovereign Spirit Saga: Volume One is for sale at Amazon US and UK. My first book, Voyage of the Dead is FREE to download on Amazon (as well as on Nook, Kobo, iTunes, etc.) as an invitation to the series. Interludes in Hell is a collection of three prequel novellas to the Sovereign Spirit Saga available at Amazon. 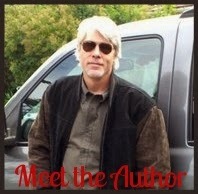 My website will be updated to include pages for Sedulity soon and my Goodreads author page. Be my friend on Facebook and/or join ApocaCon to help promote apocalyptic fiction. Thanks for inviting me to do this interview, Claire, and for posting a picture of my new release on the banner for your page! Bon voyage! Girl Who Reads is an Amazon advertising affiliate; a small fee is earned when purchases are made Amazon through the link above. The views, opinions, and beliefs expressed by guests are their own and do not necessarily reflect those of Girl Who Reads.